With GoCar you only pay for what you use. You are charged for the time duration of your trip, the minimum booking time is 30 minutes and you are charged in 15 minute blocks thereafter. There are 50 free kilometres included with each booking, any kms over 50 are charged at €0.50 per km. Each car has a fuel card so if you’re running low you can use this card at any Circle K/Topaz garage and we cover the bill. 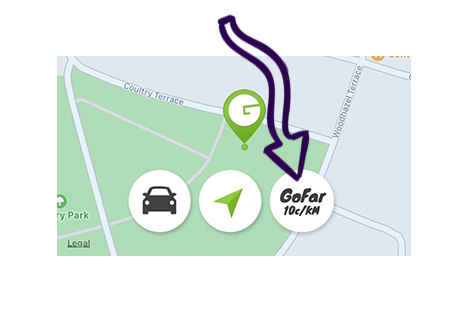 Go further using GoFar. You can now avail of a reduced Km rate of €0.10 per km when booking select cars for over 6 hours. A premium EV model with automatic transmission. Our latest EV to join the fleet, the Renault ZOE. Fully electric with automatic transmission. Big jobs made easier with our pay as you go vans. The perfect solution to a huge job! The Ford Transit Custom. You still receive the first 50 kilometers free as usual. This new mode is only available when the GoFar button is selected either on the app or website.